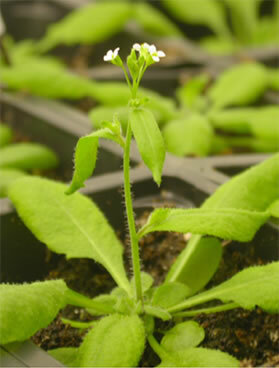 Arabidopsis thaliana: another "model organism"
This little plant has become to plant biology what Drosophila melanogaster and Caenorhabditis elegans are to animal biology. Arabidopsis is an angiosperm, a dicot from the mustard family (Brassicaceae). It is popularly known as thale cress or mouse-ear cress. While it has no commercial value — in fact is considered a weed — it has proved to be an ideal organism for studying plant development. It has one of the smallest genomes in the plant kingdom: 135 x 106 base pairs of DNA distributed in 5 chromosomes (2n = 10) and almost all of which encodes its 27,407 genes. Mutations can be easily generated (e.g., by irradiating the seeds or treating them with mutagenic chemicals). produce strains with multiple mutations.